The use of an intraoperative MRI scanner allows BNA surgeons to precisely localize tumors during surgery and obtain real-time MRI’s while performing surgical resections. Most surgeons’ technical skills are limited by an obligatory conservative surgery in an attempt to try and avoid the risk of stroke, paralysis or speech loss. Surgeons often leave a part of the tumor unresected in an attempt to avoid these complications. Intraoperative, real-time MRI technology allows BNA surgeons to confirm intraoperatively that the entire tumor has been removed while still in surgery, and thus considerably reduces the number of additional surgeries needed. 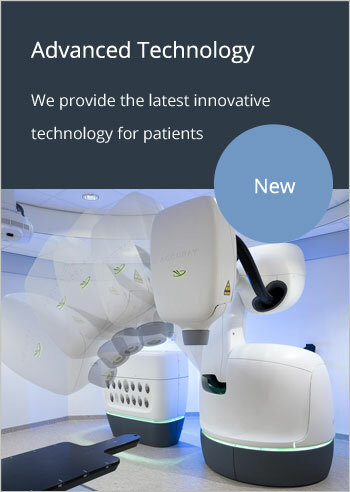 This technology helps give a new hope for our patients through a more complete surgical resection of their tumor and a decreased incidence of reoperation, thus allowing for a much faster recovery. Precise planning is a cornerstone of neurosurgery. Knowing the margins of a brain lesion, as well as the most direct path to it – one that avoids critical structures – is essential to successful surgery. A variety of tools can help the neurosurgeon to plan surgery, but none have been as successful as the latest advance in imaging, intraoperative MRI (iMRI). This latest adaptation of MRI technology transforms it into a tool that surgeons can use to visualize what they cannot see during surgery. With iMRI, physicians now can view real-time images during the actual operation rather than having to look at images made preoperatively or wait for images after surgery is over to confirm a complete resection. Dynamic changes of the intracranial contents regularly occur during the surgical procedure. 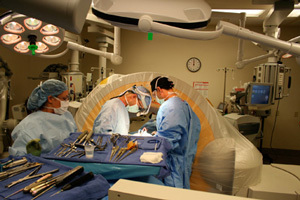 The surgeon is therefore faced with a continuously changing intraoperative field. The iMRI offers real-time visualization during all stages of brain surgery so that neurosurgeons can plan the path of the surgery at every point. As a result, surgery is more precise and with potentially superior results. We believe that the patients, and referring physicians, who count on Boulder Neurosurgical & Spine Associates (BNA) deserve nothing less than the most successful results possible. With the investment in iMRI our surgeons are offering those superior, successful results. The goal of BNA’s surgeons is to advance the field of neurosurgery by making positive changes in how cranial and spinal disorders are treated, offering patients real solutions to their health problems and delivering these solutions in less time with faster recovery periods and reduced risk. Intraoperative MRI is part of this solution and holds great promise for the future of neurosurgery. 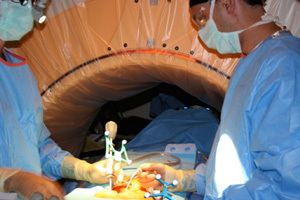 Click this link to read more about Intraoperative MRI. With the investment in this new intraoperative imaging technology, Boulder Neurosurgical & Spine Associates gave a completely new meaning to patient safety issues and set new standards for performing spine surgeries. All spine surgeries and especially those performed using minimally invasive approach, require intraoperative image guidance. Fluoroscopy is currently the standard of care in most surgical centers in the country. This allows a surgeon to see only two-dimensional views during spine surgeries despite the fact that the spine has an extremely complex, three-dimensional anatomy. By using only biplanar image guidance a lot of very important structures are usually left to a surgeon’s imagination. 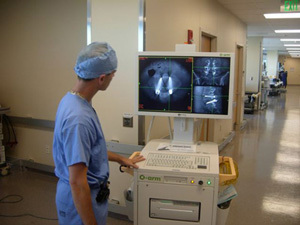 Boulder Neurosurgical & Spine Associates have replaced standard fluoroscopy by a real-time, three-dimensional imaging technique known as intraoperative isocentric fluoroscopy (Iso-C), which allows a surgeon to obtain three-dimensional images of the spine in real time. Our neurosurgeons have shared their experience with such innovative technology with their colleagues at multiple national and international meetings. In conjunction with the Justin Parker Neurosurgical Institute, Boulder Neurosurgical & Spine Associates has directed a clinical study evaluating the utility and accuracy of Iso-C fluoroscopy for the placement of a complex spinal instrumentation in approximately 100 patients. 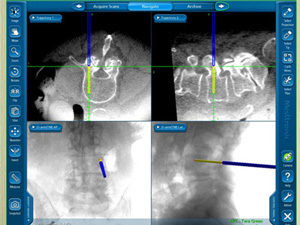 The results of this study demonstrate that patients who have surgery using intraoperative Iso-C fluoroscopy suffer far fewer complications, such as malpositioned pedicle screws or neural injuries. Another advantage is that a surgeon is able to verify or replace pedicle screws prior the closure of the incision. Although Iso-C 3-D fluoroscopy does not completely eliminate the subsequent need for conventional fluoroscopic images, its overall effect is to decrease the amount of radiation exposure to the patient and the operative staff in addition to decreasing the risk of surgical complications. 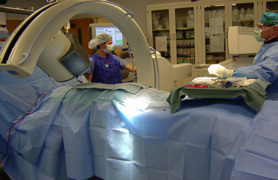 Our previous study results showed that patients received 1.5 times less radiation exposure during surgical procedures. BNA surgeons have also published data on using this image guidance technique for the minimally invasive kyphoplasty technique. The Iso-C image guidance system was used in an effort to decrease the risk of complications, operative time and the amount of radiation exposure to both the patient and the operating room personnel. The procedure was well-tolerated and there were no complications during or after the procedure. The initial cannulation of the vertebral body using isocentric fluoroscopy decreases the incidence of approach-related problems, such as inadvertent medial or lateral wall penetration of the pedicle or vertebral body. The use of isocentric fluoroscopy combines the advantages of “CT guidance” and real-time fluoroscopic evaluation of the cement fill without increased radiation exposure. BNA is the fifth practice in the entire world to acquire this new surgical imaging system. The O-arm allows BNA surgeons to obtain 360-degree images around the patient during surgery with an unprecedented image resolution and quality that is only comparable to CT scan systems. “It is like driving in the woods at night with a global navigation system. You know exactly where you are and where you are going,” says Dr. Lee Nelson. Click this link to read more about the advantages of this new technology. The effectiveness of minimally invasive procedures is enhanced by the use of the StealthStation® treatment guidance system, which provides a surgeon with a way to navigate through the body using 3D images as a guide. This next-generation technology takes images from a variety of traditional imaging sources (Iso-C fluoroscopy, x-ray, ultrasound, CT, MRI) and transforms them into precise images used for planning and guiding surgical treatment without compromising surrounding neurological structures, muscle tissue or blood vessels. The precision provided by the StealthStation system lets BNA neurosurgeons focus on the exact location that needs to be reached during surgery.